IMMUNOCIDIN®. A veterinary biologic for the treatment of mixed mammary tumors and mammary adenocarcinomas in dogs. Immunocidin® is a veterinary biologic for the treatment of mammary cancer in dogs. It's based on Bioniche's proprietary mycobacterial cell wall (MCW) technology platform, derived from Mycobacterium phlei. Mycobacteria, especially their cell walls, have been known for many years to be active against a variety of tumors. Immunocidin® is an emulsion of mycobacterial cell wall fractions which have been modified to reduce their toxic and allergic effect but retain their immunomodulatory and anti‑tumor activity. 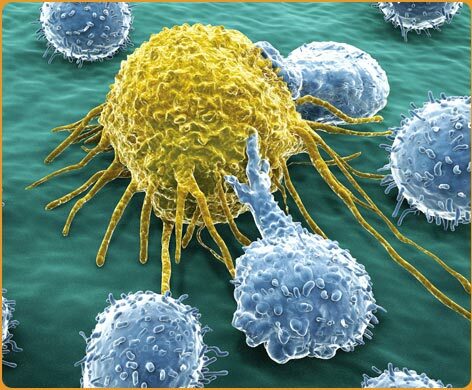 Immunocidin® stimulates the activation of a variety of cytokines and lymphocytes which in turn display potent anti‑tumor activity. Immunocidin® is administered only by intratumoral injection. Carefully and thoroughly infiltrate the tumor. Avoid intravascular injection. Larger tumors may require more than one needle stick to infiltrate the entire mass. The injection may produce pain in some animals; sedation or analgesics may be required. The emulsion separates on standing; it is important to mix it thoroughly prior to administration. Shake or rotate the vial until the emulsion has a homogeneous "milky" appearance. Dosage varies with tumor size, but generally 0.2 mL to 2.5 mL is administered per treatment (in dogs with more than one tumor, total dose is divided among tumors). 1 mL should be considered a minimum dose for the average dog; however, dose may be adjusted down (0.2 mL to 0.5 mL) for geriatric and smaller dogs. Mild fever, drowsiness, and an increased metabolic rate leading to decreased appetite may occur for one to two days following an Immunocidin® injection. These are all normal responses to the release of cytokines. Local inflammation (marked swelling and pain) often occurs following treatment, and may require the use of analgesics. Therapy should be discontinued until the reaction has subsided. Necrosis with suppuration often occurs in regressing tumours and clients should be informed that the treated area may drain for several weeks. Most dogs require three to four treatments. Tumors that fail to respond after four treatments should be considered refractory, and therapy discontinued.Treatments should be repeated every one- to three-weeks. Immunocidin™ as the sole treatment with administrations at one to three week intervals. Pre-operative Immunocidin™ treatment two to four weeks prior to surgical excision. Treatment two to four weeks post-operatively to reduce the risk of recurrence and metastatic disease. was no difference in age, dose, or treatments for either mixed mammary tumour or mammary adenocarcinoma. Intratumoral administration of Immunocidin® induces strong cell-mediated response which, in turn, directs the destruction of cancer cells. Remissions cannot be guaranteed as each tumor will have a variable response. Immunocidin® is USDA- and CFIA‑licensed for use in canine mammary tumors. 1. Ragland et al., Licensing Study Data on File. Cancer is the leading cause of death in pets over two years of age and small animal cancer cases are prevalent in the weekly caseload of every veterinary hospital across North America. Veterinarians are faced with limited availability of licensed treatment options, challenges linked to handling off-label human chemotherapeutic agents and availability of referral centres, as well as client budgetary constraints. The introduction of M. phlei-derived veterinary oncology products represents a significant advancement in the therapeutic options available for oncology cases in veterinary medicine. These novel biologically active compounds have demonstrated a distinct and unique mechanism of action that allows them to be used independently or synergistically with other oncology therapies and will provide general practitioners as well as veterinary oncologists a wider range of treatment options for small animal cancer cases. *Patient was presented with a systolic heart murmur of the left A-V valve. A post-mortem examination revealed changes of heart and lung which were indicative of congestive heart failure due to malfunction of the left A-V valve. Ragland et al., Licensing study data on file. Mangieri,J;Tondi,A: Tratamiento del osteosarcoma apendicular canino. REDVET (Revista Electrónica de Veterinaria – Veterinaria.org) www.veterinaria.org/revistas/redvet Nro 11 (vol. IV); 2003; 17* Mangieri,J.;Fiallos,R. ;Van der Linden,I. : TRATAMIENTO MULTIDISCIPLINARIO (cirugía + quimioinmunoterapia) EN EL OSTEOSARCOMA (OSA) CANINO: informe preliminar. Ciencia Veterinaria 23:31,1995. Mangieri,J: Tratamiento del tumor venéreo transmisible genital del canino con quimioinmunoterapia. REDVET (Revista Electrónica de Veterinaria – Veterinaria.org). www.veterinaria.org/revistas/redvet Nro 10 (vol. IV); 2003. If you have any questions about Immunocidin®, please download the Q&A sheet. If that does not answer your question, please contact us.